Back at you with yet another outfit post, clearly I’m on a roll! I hate how pale I am in that first photo ugh, I really need to start faking tanned haha! Anyway, this outfits a bit different to the previous two I’ve done recently, but I feel this is very ‘me’. A simple monochrome outfit thats perfect for everyday wear. My top is from Pull & Bear – one of my go-to shops at the moment, I adore pretty much everything they have to offer. Its just a simple, ribbed long sleeved top that goes perfectly with anything. 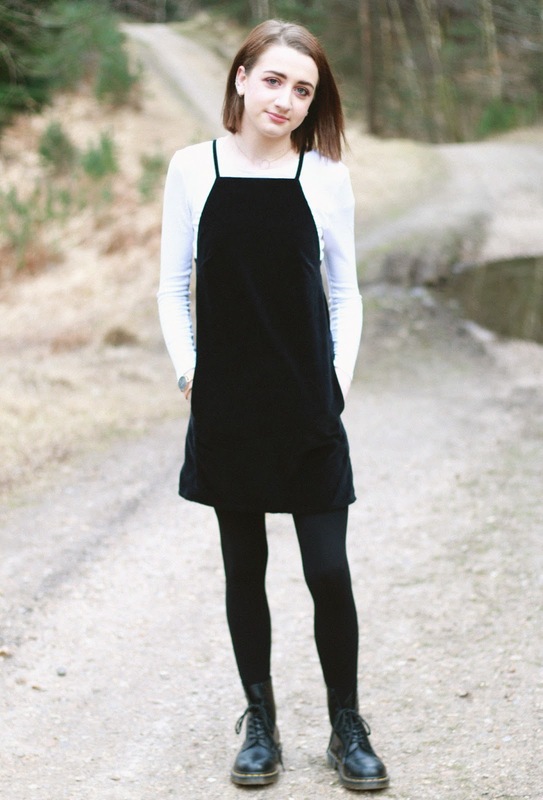 My pinafore dress is from Topshop, and I got it in the sale, yaaas! Its quite wintery, but I’m sure you could make it work throughout spring time as well. Tights are from Primark (good old Primark), and of course my Dr Martens. 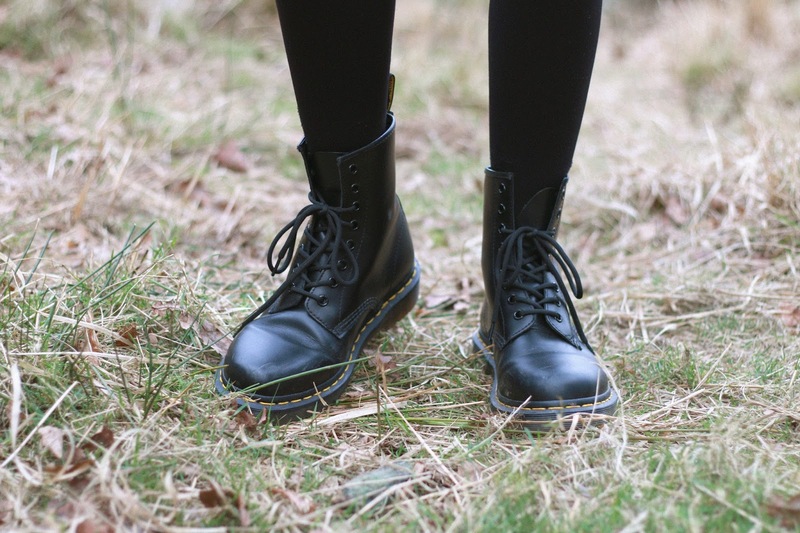 The classic boot style Dr Martens, which I definitely don’t wear enough but I think go perfectly with this outfit. Onto accessories, which is sort of the main focus of the outfit. Since its a monochrome look, adding rose gold details really ‘spices’ it up a bit if you will haha. My dainty circle necklace is from H&M, and they usually have some gorgeous jewellery for pretty cheap, I’d recommend. 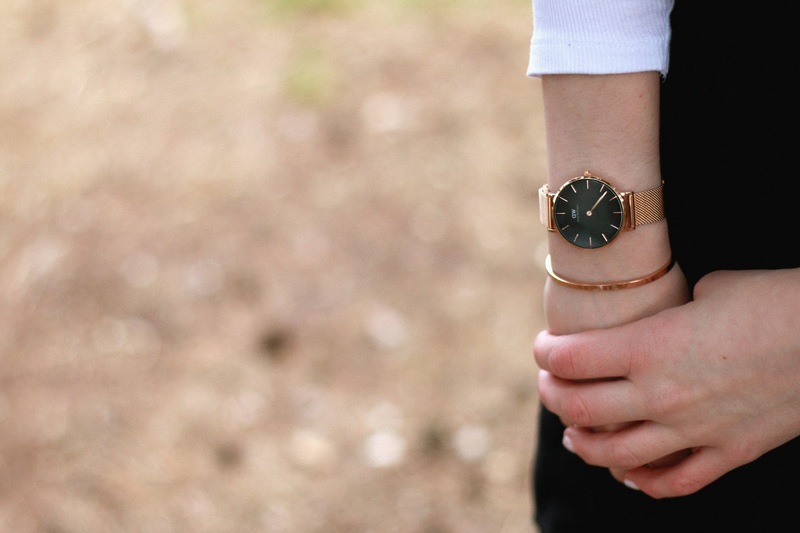 And of course, my beloved Daniel Wellington Melrose watch*. The black dial matches perfectly with the rest of the outfit, while the rose gold mesh strap adds that pop of colour. I’m still obsessed, and I know it won’t be leaving my wrist anytime soon. If you want 15% off your own DW watch, just use the code ‘FOREVERSEP15’. Overall, I’m kinda obsessed with this outfit and I’m hoping I’ll get some more wear out of it before it gets too warm!